A 1942 Fazarkley/Ishapore refirb. Got it from AIM for $39.95. I originally thought I overpaid. It was so bad I thought about a return, but figured the postage wasn't worth it. I swear it was used as a stir stick for the drum of diesel oil, sand and whatever they used to "preserve" them. After about a month of soaking and scrubbing, realized there wasn't really any paint left. The wood fore ends were punky soft. Replaced them, kept the butstock, and hit it with Moly-Resin. (I know ghetto...but it was 39 bucks!<Macklemore> ) Not the best shooter, but need to play with that damn fore end tension. Next is a Yugo stamp-over K98. I found some minor parts that still have the Waffant(sp) eagle stamps. They suggest maybe around 1939. Hard to say though. It could be a mutt. Peep sight is an add on as this has been my back-up deer rifle for a number of years. Last is a Czech VZ-24. Bought it as you see it. I like the wood. Great sharp bore, but a little dark. Need to have the eyes of a 20 year old to shoot the little v-notch. That sling attachment on the grip isn't the most comfy either. Everything matches on this one. It looks like the 50 rounds I put through it have been the only ones. Nice photos of some nice rifles, entropy. 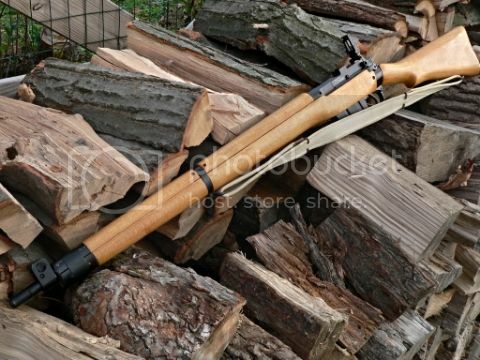 Is that a muzzle brake on your K98? A bunch. Primarily Mausers, Mosins, and USGI rifles, with a few random others thrown in. Most of which I (sadly) don't have photos of yet. I need to get photos of the rest of them. It's a spring loaded muzzle protector. Oh geez, forgot the SKS. I'll have to get a pic of that. It sits in the back of the safe like the stepchild. Unissued though. I'd love to find an Enfield Mk. III. I really like the endcap look on those. Even sweeter price. Refurbed Russian SKSs run about 3x that here in the US ($500-$600). Unrefurbed Russian SKSs run even higher ($600-$1000). 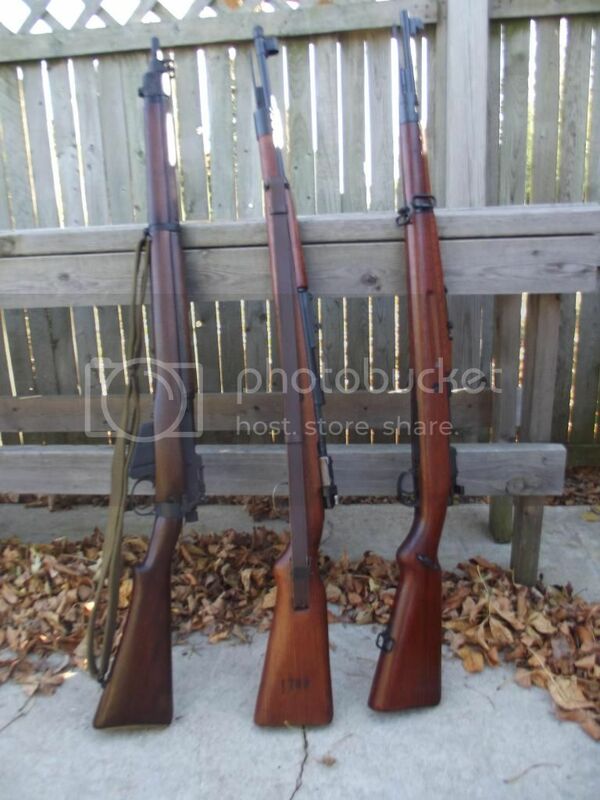 In addition to SKSs, Canadians have access to a plethora of relatively inexpensive Norinco M14s and Soviet SVT-40s, both of which are pricey in the US ($1000+) since they can no longer be imported here. They also get good prices on Soviet and Chinese surplus 7.62x39 ammo, which also cannot be imported into the US any longer. 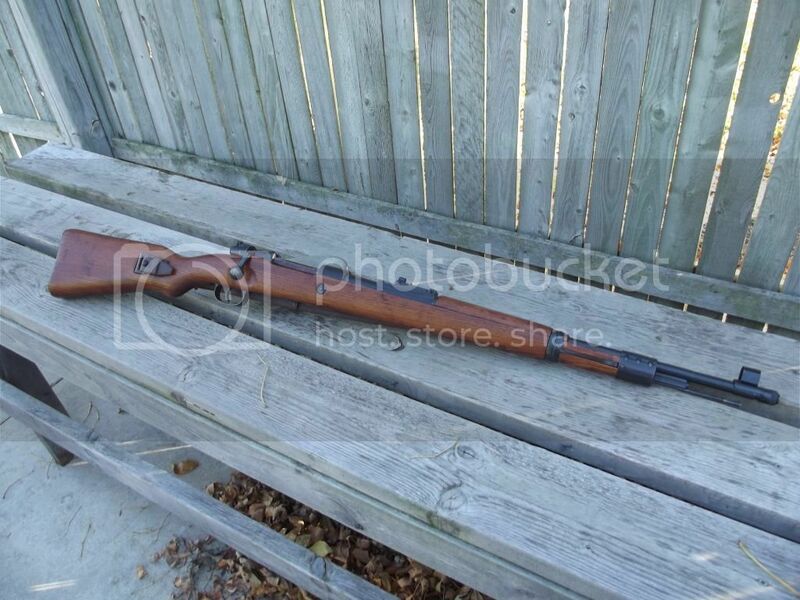 There's a local shop running a special on SVT-40s for 250 dollars CAD (237.50 USD-ish). Not bad. We do have a lot of Norinco products Russian SKS aside, I only own American and Western European guns. I feel a lot better about supporting a man or woman in smalltown, USA or smoothly-run Austrian production lines than slaves in Guangdong hastily assembling guns across the street from the Mattel toy factory. Also, I can't bring myself to put something Chinese that close to my face, maybe prejudiced but liability is not in their vocabulary apparently. I'd trade it all for some CCW though. 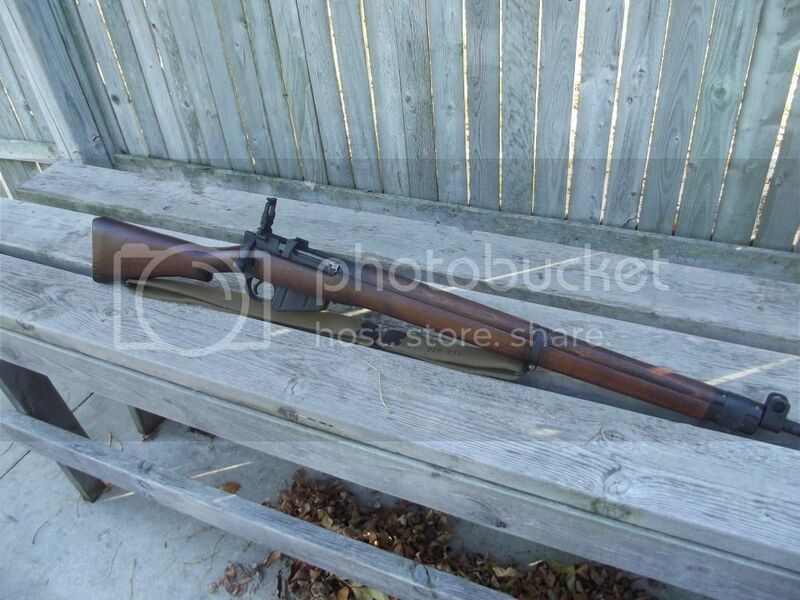 This is an Irish Contract No4 Mk2 Lee Enfield I picked up in July of 2000. It was in the original wrap and soaked in cosmoline. Big chunk of awesome right there. Wow. What a nice Enfield. Can you expand on the "Irish contract" bit? Is it a 2-groove? P.S. Finally got it re-sized, it's easier on the eyes, now! newtosig,that is a fine piece of work,I have one the factory reworked and made a garrison rifle out of.this is the first one left with all the stuff on it I have ever seen . Thanks! I picked it up at an antiques shop about 15 years ago. It cleaned up real nice, with a good bore and action. Even the wood seems almost perfect. Can you expand on the "Irish contract" bit? Exactly like it sounds. Those were a run of 50,000 No. 4 Mk. 2 Enfield rifles produced at the Royal Ordnance Factory Fazakerley in the early 1950s on contract for the Republic of Ireland. Most of these "Irish Contract" rifles were never used, and sat in storage until being sold on the surplus market in the 1990s. So they're often in new/unissued condition, with many still in the original mummy wrap. A large portion of the No. 4 Mk. 2 rifle production was intended for export, with the rifles primarily going to current and former British Commonwealth nations and territories like Ireland, South Africa, Singapore, Burma, Hong Kong, and various African and Carribean countries. Two groove barrels were a wartime expedient. By the time the No. 4 Mk. 2 rifles were being made in the 1950s, they had switched back to the standard five groove barrels. Here are some photos of the rest of my milsurp rifle collection. They're a bit dark, but it's the best I could do in the time I had. 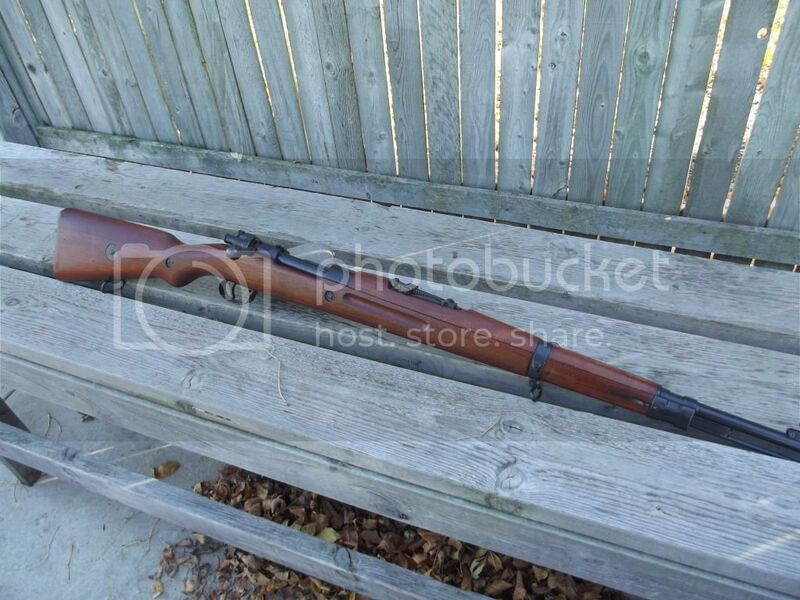 It's the oldest M91/30 I've ever personally seen. Pre-1900 M91 Dragoons converted to M91/30 configuration are pretty uncommon. Most converted Dragoons are dated in the 1910s and 1920s. This was used by the Bulgarians after WW1. They scrubbed or pinged out all of the Imperial Russian markings, and applied some of their own markings. I'm not sure of the date of manufacture, since the receiver markings were scrubbed by the Poles prior to it being sent as aid to the Republicans during the Spanish Civil War. It's actually a BSA commercial Enfield that was accepted into military service when supplies of military contract rifles ran short. So it has both commercial and military markings. Interestingly, the markings show that this Austrian-made M95 was not used by the Austro-Hungarian Imperial Army like most M95s. Instead, it was used by the Hungarian Honvédség, which was the Hungarian territorial army. Both Austria and Hungary had home defense armies, independent of the joint Imperial Army. Do you get alot of powder spray when you shoot it? Welder's helmet and asbestos gloves took care of it! I carried mine to one of our shoots,I shot a few times and some of the folks there shot it some. Them fellas they made that for must not have had any necks,I just could not get a good cheek weld and I was a pis poor shot with mine. i did find some cowboy action rounds for mine,that was several years and they were still a buck a pop. I do cast and load for it,just not shoot it.